Everyone loves comfort food, and no one does comfort food quite like the classic American diner. Here at the Villages of Citrus Hills, we have the good fortune of being surrounded by an incredible selection of local diners. If you are looking for a place that serves the best of your breakfast, lunch, and dinner favorites and is willing to put sausage gravy on just about everything, we have five perfect places that are guaranteed to keep your belly full for a price that won't break the bank. 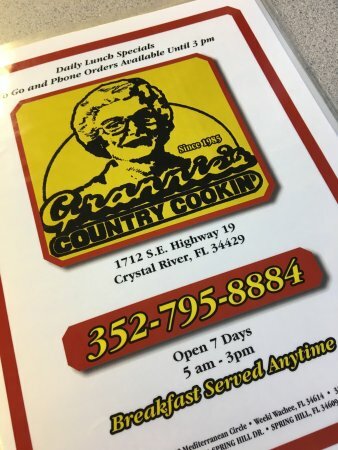 When we’re talking about diners in Citrus County, the conversation pretty much HAS to start with Grannie's Restaurant in Crystal River. This place isn't set up to impress you with fancy bells and whistles. It's a basic brick building with a simple sign on the outside. Inside, it's just a basic counter service diner with a few tables. But when the food comes out at Grannie's, everyone's mouth will be watering. Breakfast is the name of the game here, so you will definitely want to try the sausage gravy and smoked ham. However, Grannie's also puts out some delicious lunch options. Their fried catfish lunch is outstanding. Located just down the road from Grannie's is another diner that is a Citrus County staple. Sara's Diner has a similar look to Grannie's on the inside with counter seating and a few tables, but the lunch food is the big attraction here. The reuben is one of the most popular items on the menu here, and it stands up to the hype as one of the best sandwiches you will find in Crystal River. Sara's also serves an excellent turkey club, and the chop steak dinner with mashed potatoes and gravy will surely fill you up. Most people don't include chain restaurants when they’re talking about diners, but Breakfast Station has done such a good job of staying true to the classic diner experience that you honestly wouldn't know they have ten stores across central Florida. Residents of the Villages of Citrus Hills have their pick between three locations in Citrus County: Beverly Hills, Crystal River, and Homosassa. As for the food at Breakfast Station, they deliver a consistent quality that continues to impress customers. Railroad Yard Omelets are probably the most popular choice here, but they also serve traditional breakfasts, as well as some not-so-traditional dishes like the Grand Junction, which is a breaded chicken filet on a biscuit smothered in sausage gravy. While most of our local diners close for the day around 3 pm, the Sugarmill Restaurant in Homosassa stays open for dinner as well. This is where you can find classic diner-style dinners like chicken-fried steak and mashed potatoes, chop steak sandwiches, and chicken parmesan with spaghetti. The omelets are all spectacular, and the home fries might be the best in Citrus County. Since they advertise themselves as a "Restaurant & Pie Shop," you can probably guess what the big selling point is at The Front Porch in Dunnellon. If you are in the mood for a slice of pie, this is the place you want to be. They also have a wonderful breakfast menu and the lunch menu is also a big attraction with delicious soups and a Cuban Melt that will make you feel like you've been whisked off to Havana. Make a point to try all five! Enjoy!